600 Miles on the Kpipe. Now that its "broke in" a little I started taking it in the woods for a couple quick rides. This thing is a TON of fun off the beaten path. I ordered a set of aluminum bars designed for ATVs so I could get some more rise, and a little less "pull back" on the bars giving it more of a dirt bike stance. Should have those in a couple days along with a set of hand guards. Next year I will put some more aggressive tires on it, only problem I am having is finding tubeless dual sport style tires in the correct size. I might just have to give up and go for a set that requires tubes. CMS and klaviator like this. Oh- and I also ended up putting some electrical tape over the high beam indicator. It was still to darn bright. Also took my wife for a ride on it. We are at least 300 pounds combined and it did OK. Nothing I would want to do for many miles but it will make a fine ride to go along with our tent trailer when we want to bring the bicycles or kayaks instead of our two Ruckus. Good for a run to the beach, or store etc. YamaGeek, klaviator and jimroid like this. It was nice out this morning so I adjusted the valves. It was pretty easy once I had everything ready to go. I had about 1200 miles on the clock and its their first adjustment. They were pretty far out of spec. I would recommend following what's in the manual... I was just planning on doing it just after 1000 then again every season depending on how much I ride it... It runs and idles much better now. Also did an oil change, chain adjust + lube, checked the air filter blah blah blah. Good to go for the season! If anyone has any questions about a valve adjust on the K-pipe post up and I will do my best to help. I set mine at .002" but given the access and room to work I am sure its somewhere between .002"~.003"
Next oil change I am going to pull the case and inspect the strainer screen for the oil. I would be tempted to sell one of my other bikes for a K-Pipe if it had a normal motorcycle transmission and clutch. It would be a lot like a moped, but bigger with more power and speed. If you can travel around the world on a Symba, you should certainly be able to do it on a K-Pipe. It is still small enough (or at least look small enough with me on it) to get away with riding on the shoulder, and would have the gearing to climb anything. Seems like a way better deal than a Ruckus to me. And cheaper. I would be tempted to dell one of my other bikes for a K-Pipe if it had a normal motorcycle transmission and clutch. It would be a lot like a moped, but bigger with more power and speed. If you can travel around the world on a Symba, you should certainly be able to do it on a K-Pipe. It is still small enough (or at least look small enough with me on it) to get away with riding on the shoulder, and would have the gearing to climb anything. Seems like a way better deal than a Ruckus to me. And cheaper. It has a clutch. Its engine and transmission design is very similar to the C90 in theory, but it doesn't have the auto shifter engaged clutch, it has a manual one. You need to use between gears, but its not necessary when coming to a stop, though I tend to use it anyways, habits and all. 1600 miles in total. I really enjoyed my time with the K-pipe it was just time for something different. I just traded it in on two Kymco Spades, "his & hers." I think if I were to get that style of bike again, the horizontal 125 semi auto I would probably look for an old C90 or something a little bit more comfortable for longer distances. My biggest complaint on the K-pipe was seating position, it is almost like it was trying to be to much like a sport bike without actually being one, if that makes sense. The spade is a bit smaller, but the seating position is roomier and more standard. Perfect seat height for us shorter folks as well. While I don't have a K-pipe any longer I will still answer any questions about it, that I am able to. I keep looking at these. My daughter is 17 and is 5'6" and weighs 115lbs. She has a 1975 CT90 now. A Suzuki Van Van would be perfect for her but they're 1.5 times the price of the Kymco. I'd buy a Honda S90 in a heartbeat if I could find a decent one but this is a modern equivalent. Love my spade, the 5th gear makes a difference. Solid Little bike. 6k miles no issues. How well do you think the K-Pipe would handle a 240 pound rider? I actually fit on it fairly well. I put over 12,000 miles on an '06 Kawasaki Eliminator 125 riding around on southern AZ rural roads, but the K-Pipe doesn't seem to be quite as substantial. The Spade is cool, but just a bit too small. I saw a guy about my size on a Grom a while back, he looked like Shaquille O’Neal on a BMX bike. I am currently 220, 5'8 and it handled me fine. Obviously any real rough stuff and guys like you and I will bottom out the suspension, but as long as your not expecting a dirt bike you will be fine. I actually rode mine in the woods a couple times, its very nimble. Don't expect up hill top speed to be more than 40mph. My wife weighs just over 100# and she could stay in 4th gear up hills. Other than a slight incline I would have to drop to 3rd and settle in at 40mph, 45 if I wanted to piss pound it. With all that said I need to loose 30# to get back under 200. 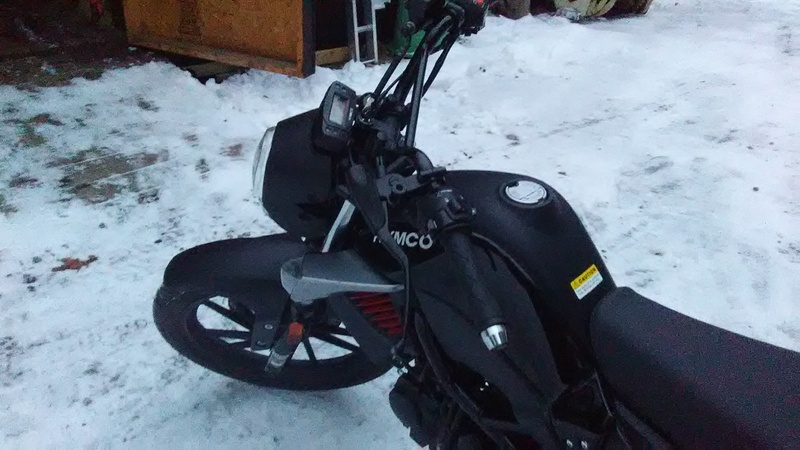 I was thinking about riding it moped style, on the shoulder mostly. Most mopeds like Puch and Tomos have about a 180 pound weight limit. I also like the fact that it has tubeless tires and a carburetor. And there is a Kymco dealer only a few miles away that sells new scooters and used motorcycles, and they take trade ins. I should be able to get almost enough out of one of my motorcycles that I rarely ride to buy a K-Pipe. It could be ridden on the shoulder of any non freeway road in my state, and the fact that it actually has gears means it could climb any mountain in my state. Maybe not fast, but I could downshift and at least keep the engine spinning in it's powerband, something you really can't do with a 125 CVT scooter. I may even get one of these. There is a Kymco dealer on Kona, Kiser Motorcycles. That's about 85 miles from the Hilo side where we live. And, yeah, I'd probably take the shoulder on the highway. 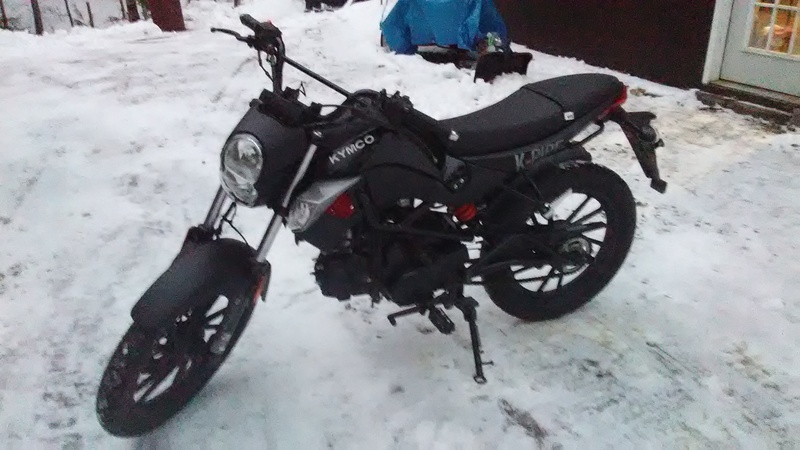 No storage, but a lot less than a Grom or even Ruckus. Kymco makes good stuff. Two year warranty too, unlike Honda/Yamaha/Suzuki/Kawasaki AND even Vespa. After owning both a K-pipe and soon to own a Spade, I highly recommend spending time sitting on both, even if only in a show room... The seating/ riding position on the spade is significantly more "roomy." For the K-pipe to be semi comfortable for me I had to go with a set of "high bend ATV" bars that were cut down by a few inches. I was able to get 70mph down hill with a tail wind on the speedo. Realistically it was probably 65mph. 55~60mph is what can be expected on a level straight line blast. Couldn't stay away from the K-pipe to long. 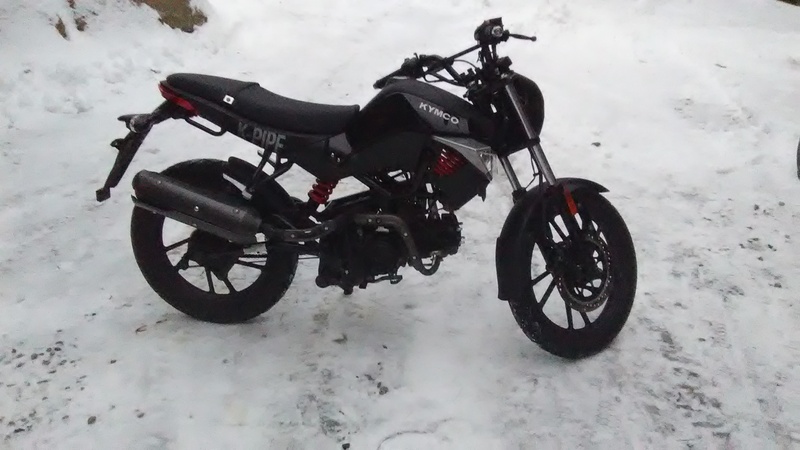 Found one for sale during these cold winter months, ended up with it for $700... 2017 with 250 miles on it. Needs a few little things from falling over but all said and done I am happy to have another, for $700. Needs the front signal lights put back on plus one replacement lens... I am going to put some cut down high bend ATV bars on it like I did my last one, plus a bit of cleaning/ touch up and it should be good to go. Fresh oil change, adjust the adjustables and it should be good to go! The Virginian, klaviator and Shin1ichi2002 like this. Was hoping to see pics with the knobbies and high bars! I just looked through my pics and I don't even have any of my last one with the high bars and hand guards... I am 5'8 on a good day and its much more comfortable with high bend ATV bars. They need to be cut down a bit but its worth the fitting. I also put a pair of tusk hand guards on my last one and will do it on this one. The tires on the one I just got are about brand new and I always have a hard time taking of like new tires... Not sure how much I will use this off road for more than just dirt/ seasonal roads because I have a KE100. I think I will get the parts I need in the next month or two, but probably wont start messing with it until it warms up as my shop isn't heated. I have always liked the K-Pipe! I have had it on my radar screens off and on since it came out but sort of moved on to other ideas and its not likely now. However I am seeing some screaming deals on them. Not so much in my market but somewhere out there someone is getting a screaming deal. About the lowest in my market for a brand new unit is about $1,700 but I have heard $1000 to $1,200 out there for a brand new one. I like the K-Pipe, but I don't fit on it very well. I wish they had made it more spread out. It feels about the same as a Tomos Streetmate moped I rode once. I wonder if they have fixed the shifter design yet. My understanding is that it was supposed to have a regular shift pattern and a manual clutch. It has a fully functional clutch that needs to be used when shifting between gears... I mean you can shift it without the clutch like any motorcycle but I don't like to. Clutch is optional when coming to a stop. I use it out of habit most of the time. I also wish it was a bit more roomy, but size wise its very similar to other street legal bikes in the CC/ size range. I think you would be hard pressed to find a brand new one from a dealership for 1k... Maybe 1500 if its a two year left over? -Used? Yea I think you will start seeing them pop low mileage in the 1k range. Unless you get one really knowing what it is, it could be pretty easy to "out grow." It looks sport bikeish, but its not a sport bike... Its a like a C-90 in a sport bike/dirt bike skin.